How is an Internal Auditor Different From an External Auditor? If you have always dreamed of pursuing a job in accounting, it is important to know the difference between internal and external auditors. Auditors in all settings play a very important role in reviewing financial records for accuracy and completeness. While many of the duties are similar in nature, the primary purpose of an internal auditor is very different than the primary purpose of the external auditor. It is important to understand what your roles will be in either position before you start applying for career opportunities. Read on, and find out the differences between internal and external auditors. Perhaps the most obvious difference between each role in the auditing industry is the setting that each professional works in. If you work in internal auditing, you will work as an employee within the organization that you are auditing. You will review the risk management policies, internal control systems and the financial records so that you can report to a committee of executives on the controls or management of finances within the organization. An external auditing professional will work for an independent agency, either public or private, and will report to the shareholders of the company that they are auditing. Their primary role is to review financial records and statements to ensure that they are complete and truthful. They will also monitor the internal control systems in place and report if there are vulnerabilities present. External auditors have an entirely different responsibility than an internal auditor does. In the world of auditing, professionals who work within the organization that they are auditing are responsible to their managers, the auditing committee and the company’s directors. The external auditor is not responsible to the company itself, but instead the shareholders who have invested in the company and rely on the truthfulness of the financial records. Shareholders may include the government, owners and the public as well. The external auditor has a lot more freedom than the internal auditor when it comes to what types of records and documents they have access to. Internal auditors are assigned specific projects by management and they will have statutes from management that they must comply with. The external auditor, on the other hand, can access the system and all of the documents instead of just the details that is pinpointed by management. Both parties need to give researched and unbiased recommendations on their observations. 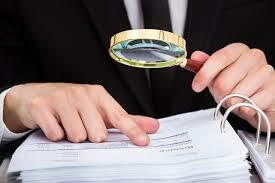 To examine financial records and systems you need to have a very detailed eye and be committed to organization. If you are interested in becoming an auditor, you will be happy to hear that demand in the field is projected to grow by 13% by the year 2022. This growth is faster than average, making auditing a great industry within the accounting discipline to enter into. If you are serious about pursuing a career in this field, learn the differences in the roles of internal and external auditors so that you can choose the direction that best suits you.